Variety is the spice of life, they say. For manufacturers, variety, be it in product mix, markets served or processes employed, can be the ticket to avoiding volatile economic ups and downs while adding flexibility to take on all types of work. Near Nashville, TN, Quality Industries is all about variety. Founded in 1972, the family-owned company has grown to be one of the largest and most diverse independent metalforming and fabricating manufacturers in the United States. With the addition this fall of a 60,000-sq.-ft. facility in Denton, TX, Quality Industries and its 500-plus employees will use more than 330,000 sq. ft. of manufacturing space to serve industries including heavy transportation, alternative energy, electrical enclosures, and towing and recovery equipment. Under roof are 5,000-W laser-cutting machines, manual and robotic welding cells, CNC punch presses, press brakes, stamping presses, integrated assembly and metal-finishing cells, and powder-coating and wet-paint lines. Backing it all up, Quality Industries’ engineering team works closely with customers to refine and improve designs, identify proper, efficient processes, and minimize production costs. Such a complex and diverse operation demands efficiencies anywhere and everywhere to stay successful. Recently, Quality Industries put its welding operations under the microscope—with human welders scarce, the company has sought to automate where it could. As many as 20 welders help fabricate aluminum boxes for heavy-duty vehicle wreckers. Robotic welding provides a big assist in meeting increased production demands and in navigating a shortage of high-skill welders in the Nashville, TN, area. 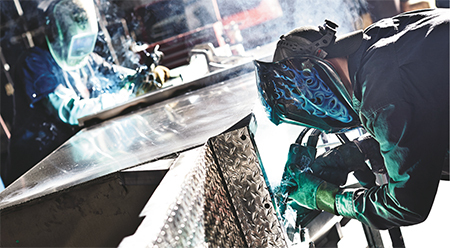 At Quality Industries, welding finds its most intensive use in fabrication of aluminum boxes for heavy-duty wreckers—tow trucks for large vehicles. Twenty human welders primarily GTA weld these boxes. MetalForming witnessed this operation during a recent tour with Warren Hayslip, president and CEO, and Terry Tidwell, vice president of sales and business development. The company also employs a large number of welders to fabricate structures that support solar panels. These operations were candidates for robotic welding due to the manpower issues described above, and also due to increased production demands. 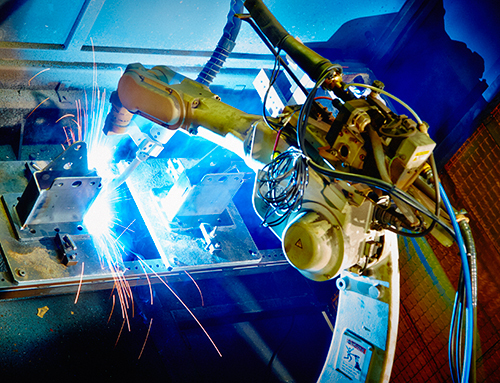 In these areas, increased use of robotic welding has brought a number of advantages. Parts produced at Quality Industries are assembled for delivery to customers in industries including heavy transportation, alternative energy, electrical enclosures, and towing and recovery equipment. One example: the addition of a Panasonic dual-robot turntable using welding equipment from Miller Electric. Previously, tack welds provided by human welders held parts together for welding of the assembly via an older robot. Testament to the company’s forward thinking, engineers developed what they refer to as “no-tack fixtures” to work in conjunction with the dual-robot setup. That cell was tailor-made for processing thicker steel, according to Ken Ham, Quality Industries’ vice president of engineering and technical services. “The water-cooled, higher-amperage torches use large-diameter flux-cored wire, allowing us to run a faster welding rig than is possible on some of the other equipment we have here,” Ham explains. 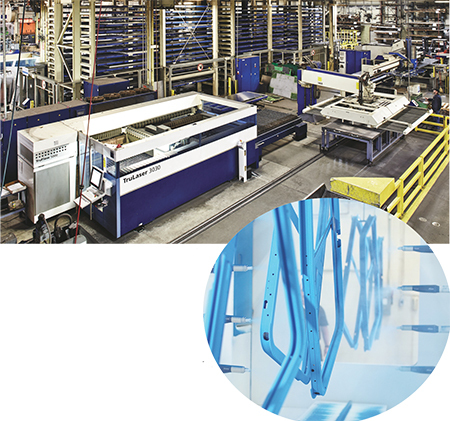 Besides robotic welding, Quality Industries’ capital program includes investment in a new powder-coating line (right), CNC punching and laser-cutting machines (top), stamping presses and more. Seam-tracking technology improves quality and productivity in this cell. “The real challenge for us is making sure that material movement and flow around those areas are improved,” adds Fann. Efforts are underway to do just that. In adding to its robotic-welding roster, Quality Industries has sought to commonize its equipment, according to Ham, to ease training, maintenance and operation, and to better standardize and simplify fixturing to improve workflow. Though robotic welding is thought of as most applicable to higher-volume applications, Quality Industries also has incorporated the technology into a low-volume workcell. “A single robot handles three work zones in this cell,” says Ham. “We constructed the cell so that we can weld in any one of the three zones with changeover and setup taking place simultaneously in the other two. This allows us to run lower-quantity jobs across a robot and still stay efficient. The enhanced welding capabilities are part of Quality Industries’ $12.5-million company-wide capital program, undertaken to significantly bolster efforts to better serve customers and achieve growth, while improving overall quality and efficiency. Recent updates also include a complete stamping-press rebuild and installation of a quick-die-change system. Also, the company acquired a new Stamtec OCP-260-L 286-ton single-point gap-frame press. The press is served by a Tomac TLN2-300 compact servo-driven feed line. Stamtec supplied and installed the feed line and press.